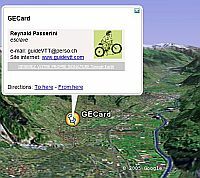 This is an interesting idea: Add an additional link to your E-mail signature which contains a Google Earth signature "card". 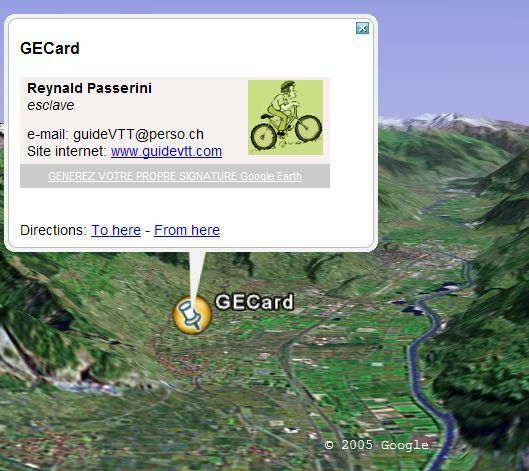 The "GECard" is a placemark showing your business (home, hobby, or whatever) location, and the description includes the typical details you would include in a signature file. A GEB reader named Reynald Passerini wrote me that he had created a "GE Card generator" (it's in French). By filling out a simple form, you create a GE KML file with your signature automatically. As an example, here is the signature he sent in his message. There's no reason why you couldn't have a more extensive signature KML file which contains all kinds of information. If you have a business you could contain information and pictures about your products with links to more information. You could have other placemarks showing where your products are made, where your products are being used, or customer endorsements. For your personal signature you could create placemarks related to your favorite hobbies, favorite Google Earth files, the possibilities are endless. What a great idea! I also think this is a great idea. Thank you for sharing this information with us. Are you sure you filled the form correctly? The form has Longitude first, then Latitude (which threw me off at first). Also, make sure you use a "-" sign for Longitude (for West longitude coordinates). Nice idea and easy to use, but I have little idea as to how to use what is sent. How do I put code into MS Outlook as part of my signature? Does anyone know? Great way to pinpoint far away family members. However I disagree where you have placed Smiggens Hole in Austarlia. It is a ski resort adjacent to Perisher Valley. Can you please check and correct. Hi, thanks for comments. I just made some updates. And I have changed latitude/longitude order, I agree it was really confusing. I see that it would be nice to have some detailed examples how to use these links... will prepare something. The Whitworth Inn is placed incorrectly on the Google Earth. How do I know this? because I live right across from it. It is placed near Paradise Point road when it should be placed across from Lake Run Dr.
Why are the pictures out of focus, even at 800 feet. How3 can this be corrected?